If you are interested in working for yourself, what have you done to prepare? Working on your own isn’t a split-second decision. It requires planning and investment. 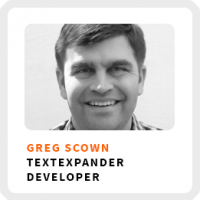 Greg Scown, believes starting a business is all about taking the time to build your skills, connections and cash. He’s the founder of Smile, a boutique software development company that creates productivity software for Apple products. Some of you might already be familiar with its most popular application, TextExpander. For those of you who are less familiar, it’s a typing time saver that enables you to type words, phrases or sentences using just a handful of characters. Why after 18 months of working on a software product Greg decided to abandon it. How taking a job working for a community website for teen girls helped build his war chest and helping him meet his future business partner. Focus on solving a problem when starting your business. Then keep taking action. Align habits with your purpose. Core work activities + habits: 1) Responding, being on top of communications. 2) Paying attention to the money. 3) Keeping an eye on where the business is going. Ideal work environment: Working from home, being able to get up from the desk and still be productive around the house. Superpower: Being able to juggle things. Book recommendation: Cloud Atlas by David Mitchell. 90-day goal: Continue to grow TextExpander and build out the sales funnel. Look into the Service Corp of Retired Executives (SCORE). It’s a great way to build your mastermind network and learn from others who have gone down similar paths before you. Greg’s blog Code. Cook. Read.